But I know it has to be a dish from the mughlai cuisine. I passed on their luxurious kebabs, their sumptuous butter naans and arrived at my personal favorite - the biryani. 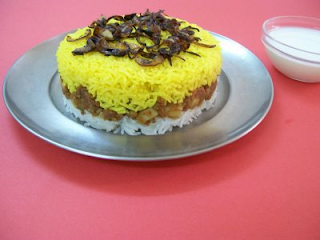 Biryani is a layered rice dish. Plain white and colored (usually saffron) rice is layered with the chosen meat, packed in eartherware dishes and left to slow cook for hours. Of course, my recipe is a little less time consuming and vegetarian. I could have replaced the meat with boiled mix veggies to make sabzi biryani. But I decided instead to recreate the oft-ordered, much-loved aloo chhole biryani of a local restaurant. The preparation for this biryani starts the previous night. Soak 1/3 cup of black chane overnight. For the uninitiated, black chane are a smallish brown variety of chickpea grown in India. Boil until done the next morning and drain. Also boil 2 potatoes, peel and chop into small cubes. You need two cups of long grain basmati rice, cooked one cup at a time. For the first cup, simply boil rice in 2 cups salted water until done. Cook the second cup of rice the same way, but also add 1/4 tsp turmeric powder to water. I dont like saffron myself, but you can always replace turmeric with a few strand of pure saffron. Heat 1 tbsp ghee and roast all these ingredients until they start giving out a fragrant aroma. Cool and grind to a paste with a little water. Heat 2 tbsp ghee in a pan and fry the paste till the ghee separates. Puree 3 tomatoes and add to the pan. Cook until the mixture starts looking fairly dry. Add the boiled chane and potatoes plus salt to taste and simmer for a few minutes. Now we have all the parts of our biryani, so let's assemble it. Grease a shallow round dish with ghee. Spread yellow rice to fill 1/3rd of the dish. Next, add a layer of the chane/aloo mix and finally top with a layer of white rice. Press down and smoothen the surface, then place in an oven preheated to 180C for 5-10 minutes. Remove, unmould and garnish with fried onions. It's hot and spicy, so serving plain yogurt alongside the biryani is always a good idea. this looks spectacular. i really enjoy these kind of dishes. perfect for the mm! hey, your title matched with mine! hehehe... let's swap. i have the curry and rice kheer for dessert. Great dish! my boss was from Bombay. Hi Simran, I'm your partner in Taste and Create for May, and I made this dish. Incredibly yummy and pretty to look at too. Thanks for showing me a new take on biryani. I'm so full I'm cross-eyed and tomorrow is the Daring Baker reveal date so I won't have my version posted for a few days, but I made this tonight and it was sooo good.